On the ridges of Gettysburg and the island of Iwo Jima, in the trenches of the western front and the jungles of Vietnam, and across the sands of Normandy and Iraq, brave soldiers gave their all to complete their missions. 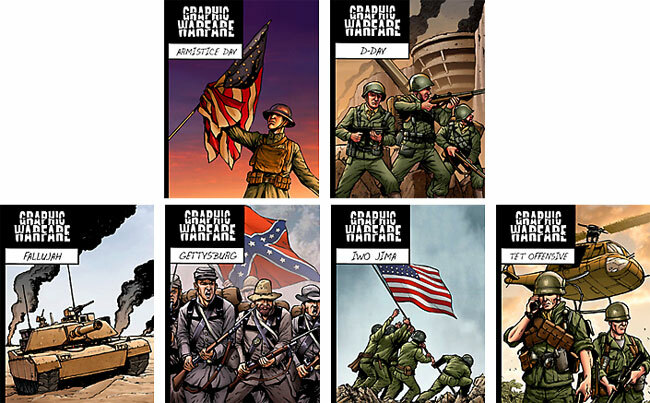 Experience engaging interpretations of these historic events with Graphic Warfare. In this series, action-packed illustrations and exciting, fact-filled narration bring the riveting action and sweeping adventure of these conflicts into vivid detail. Maps, a timeline, quick stats, and more illustrate each conflict's cost and the sacrifice made by both military and civilian participants.